The early spring bulb meadow is an area of the garden that I keep coming back to. Early flowering bulbs tend to be low to the ground as they are hardy enough to cope with lingering, rough weather. When I crouch down to look at the early iris and crocus bulbs in February and March they are a blast of colour and fascinating detail. Stand up and look down on them and they can look a bit humble before they really get going. I haven’t got time to spend all day crouching, so the solution is to look at where they have come from, and plant them in a similar way. Take Iris histrioides, commonly known as ‘winter iris’. It’s typically a vivid blue iris in various shades. In Turkey, where they grow in the wild, they burst through the ground on naked stems and turn mountainsides blue. Inspired by this I’m planting more and more bulbs for early spring, so that in years to come we will have our own carpet of colour. Some of the iris varieties here are unusual, so bulbs are expensive or impossible to find in bulk. That’s why I’m letting mine bulk up their numbers naturally, whilst under-planting with the easy-to-find Crocus tommasinianus. The light mauve of the crocus and deeper blue of the iris work perfectly together. I’m looking forward to the days when they have naturalised so abundantly that we need to thin them out. I can’t recommend winter irises strongly enough. 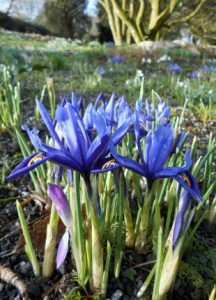 Look out for the readily available Iris reticulata in the garden centres or online. There will be a number of varieties to choose from. Plant them in the autumn a couple of inches deep and look forward to the day in February when they push up and turn out blue. You don’t need a bulb meadow or mountainside to enjoy the power of these irises. They are perfect for well-planned pots partnered with violas or winter pansies. They also make an impact in small areas where their colour will pack a punch. Just make sure the drainage is good. They are pretty tough, even pushing their way through snow and ice. Get your camera ready for that; it makes a change from snowdrops!